When you think of LA, most people don't think of farm animals or pie-baking competitions, but we have 'em. Yep, we sure do. At least once a year, during the Los Angeles County Fair. Not all of the county is urban, so local farmers bring their rabbits, goats and pigs to show off their biggest and best. Quilters and jam makers whip up their best patterns and recipes. You can learn about organic farming and gardening, and how to cook those vegetables you've never seen before. Of course, you can also stuff yourself with turkey legs, deep-fried Oreos and chocolate-covered bacon, shop 'til you drop in the exhibit halls, ride carnival rides, watch sea lions and pirates perform and rock out to nightly concerts. My favorite thing is still watching city teens taking selfies with farm animals. Here's what's new and who's playing this year at the LA County Fair. Admission: Adults $14 weekdays/$20 weekends/holidays; Seniors 60+ $10/$15; Child 6-12 $8/$12; 5 and under Free. $29.99 Season Pass. Check the website for rates and promotions. Check Goldstar.com for discount tickets. Carnival Ride Tickets or wristbands are extra. Location: The Fairplex in Pomona, 1101 W. McKinley Ave, Pomona, CA 91768, off the 10 Freeway, exit Fairplex Drive or White Ave.
Public Transportation: Metrolink trains run from Union Station in Los Angeles to the Fairplex Station. There's a shuttle from the station to the Yellow Gate pedestrian entrance. The Foothill Transit 197 bus also goes from the station to the Fairplex. A Yellow Cab stop is outside the Green Gate. Wheelchairs, scooters, strollers, double strollers, wagons and lockers are available for rent at the Yellow, Blue and Green Gates. Package check service is available at the Grandstand. ATMS (Interlink, Cirrus) and check cashing services are available. ANY DAY Tickets: $12/adult $6/child any-day tickets are available at participating Vons, Albertsons and Cadenas supermarkets. Costco Special: $59.99 for 4 adult tickets,1 parking pass and 44 ride & game tickets (rides and games require multiple tickets). Available in-stores and at Costco.com beginning August 16. O'Reilly Auto Parts Wild Wednesdays - present O'Reilly's receipt or free coupon from any O'Reilly's store for Fair admission and a carnival ride wristband for just $29. Noon – 5 pm Donate five canned goods (per person) and receive one free admission that day only. Happy Hour - $2 off Fountain Drinks, Draft Beer & Margarita at participation Stands Wednesday through Friday from 3 pm to 6 pm. Community Day Discounts and Parades - the LA County Fair offers discounted admissions to residents of surrounding communities on their designated community day, which also includes a community parade and community hero presentations. Week for Heroes: Sept 7-11, 2016, $2 admission for active & retired military, reserves, fire, police and paramedics w/ ID plus 1 guest. Additional promotions at Costco, Subway, O'Reilly's Auto Parts and King Taco. Wonderland: A Floral Fairy Tale is the theme for this year's Flower & Garden Pavilion, with displays depicting scenes from Lewis Carroll's classic Alice in Wonderland. The Magic World of Dragons, Wizards & Beasts will take over Building 10 with a dragon-themed castle exhibit with tons of interactive exhibits and live animal interactions. In addition to the new additions and updates on the previous page, here's a taste of a few more fun things you'll find at the Los Angeles County Fair. The Farm expanded tremendously a couple years ago, covering four more acres. The expansion features over 100 specialty crops grown in California and a kitchen for demonstrations on how to cook locally grown produce. Farmers are on hand to give growing advice. You can have a taste of some of that produce on wood-grilled flatbread at the new Farmhouse Grill. 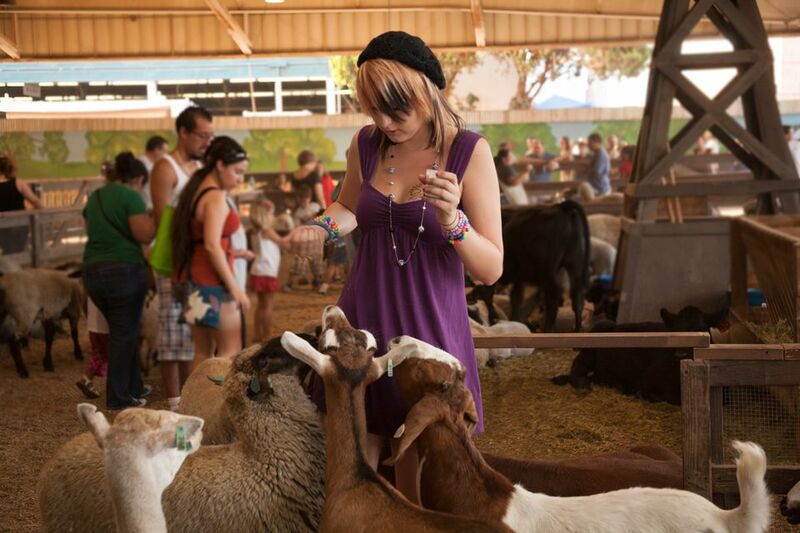 Goat-milking and learning about wool join the other petting zoo animals. You'll also find the Heritage Mission historical reenactors and craftspeople at the Farm. Mojo's Wild & Crazy Lagoon is back. This water feature is home to some interesting interactive animal exhibits. Adventures in Literature is the theme of this year's America's Kids exhibit, which features costumed characters from favorite children's books and interactive activities. Wilderness Ridge - join Smokey Bear and friends to learn about protecting the wilderness. Esmeralda's Traveling Circus brings amazing acrobats and jugglers to the LA County Fair. Cirque du Feu combines old school circus with modern day theatrical stunts. For an additional fee you can learn a few circus tricks yourself. Garden Railroad Historic Trains - the Fairplex Garden Railroad is the oldest and largest garden railroad in the nation, with an acre of detailed, scenic landscape and more than three miles of winding track. Open noon to 8 pm. Rail Giants exhibit of real steam engines and diesel locomotives. The Millard Sheets Gallery presents One Path Two Journeys – Judithe Hernández and Patssi Valdez. Exhibit halls filled with every gadget and gizmo you can imagine and some you'd never think of. The Wine & Spirits Marketplace features tastings of the winners from the Los Angeles International wine, beer & spirits competitions. General admission to the concerts is included in Fair admission. Premium reserved seats for concerts require an additional fee ($44-$165). This year your concert tickets DO include Fair admission. A limited number of free assigned seating tickets are available at the ticket booth on Floral Lane across from the Grandstand box office starting at 2 pm the date of the performance. All Grandstand events begin at 7:30 pm and are subject to change without notice. Get Tickets Online. Other Fair entertainment includes the Tribute Bands, High School Marching Band Competition and the Grinding Gears Nightclub. High School Marching Band Competition – bands compete throughout the Fair, check the schedule for parade dates and times. Culinary Competitions - Chefs and home cooks compete in all kinds of categories from pies, chocolate chip cookies and brownies to BBQ, tamales and everything bacon. America's Kids Competitions are educational and creative competitions for kids from pre-school through high school. A Week for Heroes, Sept 6-10, 2017 all active and retired military, reserves, police, firefighters and paramedics with valid ID, can attend the Fair with one guest for just $2 each. $1 from each admission will be donated to Vet Hunter's Project.